Azelaic acid is a naturally occurring substance that studies have shown to inhibit 5-alpha-reductase in human skin. 5-alpha-reductase converts testosterone into dihydrotestostrone (DHT), accumulation of which in scalp is believed to be responsible for the male pattern hair loss. Inhibition of this enzyme by azelaic acid can reduce the concentration of DHT in scalp and therefore stimulate hair regrowth. Azelaic acid can be found in many prescription acne medications. Azelaic acid is added to minoxidil solutions in hair loss treatment products because it has different mechanism of action in preventing hair loss. Finasteride is a synthetic chemical; it is one of two main hair loss treatments that works by a similar mechanism as azelaic acid. 1. How is Azelaic acid compared to finasteride as a DHT blocker? It seems that both azelaic acid and finasteride do the same thing. So which one is better? 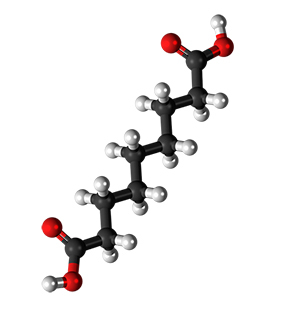 Let's first take a look at the structures of finasteride, testosterone and azelaic acid. Finasteride has similar structure as testosterone (see Figure below). It is a specific competitive inhibitor for type 2 5-alpha reductase that converts testosterone to dihydrotestosterone (DHT). If you have read enough, you will know that high level of DHT in scalp is the cause of male pattern hair loss. So to lower the DHT level in the scalp is the key to reverse hair loss. To convert testosterone into DHT, the reductase has to bind to (or “swallow” to put it in layman's word) testosterone first. When finasteride is present, finasteride will be bound to the enzyme first (because reductase likes finasteride a lot more than testosterone) and block the active site of reductase. As a result, reductase will no longer be able to bind to testosterone and convert it into DHT. Azelaic acid has drastically different structure from testosterone (see the Figure below). It is a non-specific competitive inhibitor. In other words, 5-alpha reductase is not a big fan of azelaic acid and has no interest in “swallowing” it. However, when the reductase is surrounded by numerous azelaic acid molecules and it will involuntarily and accidentally “swallow” some azelaic acid which will in turn inactivate the enzyme. That is why much higher concentration of azelaic acid is needed compared to finasteride to be effective . You may have also read somewhere that says Azelaic acid is a both type 1 and 2 5-alpha reductase while finasteride is only a type 2 alpha reductase, and may think azelaic acid is better than finasteride. This is both correct and incorrect. As mentioned above, azelaic acid is a non-specific competitive inhibitor. Neither type 1 nor type 2 alpha reductase likes to swallow it very much. It swallows azelaic acid just because the reductase is all surrounded by azelaic acid and involuntarily intakes it. If the same high concentration of finasteride is used as azelaic acid, it will block the activity of type 1 5-alpha reductase as well. The problem with use of very high concentration of finasteride is the possible side effects. The higher concentration of finasteride you use, the higher chance you may get finasteride side effect. The good news is that clinically studies have showed 1mg of finasteride (0.1% finasteride topical solution) is safe. The chance of having finasteride side effects is almost negligible. 2.Is azelaic acid enough in Minoxidilmax solutions? As pointed out above, azelaic acid is a relatively weak and non-specific DHT inhibitor. It requires high dosage to be effective. Is the azelaic acid dosage high enough in Minoxidilmax products? In a study reported in the British Journal of Dermatology (Stamatiadis. 1988;119: 627-632), inhibition of 5-alpha reductase is virtually complete (98%) at 3 mmol/l. MinoxidilMax solutions contains 5% azelaic acid, which is 88 times the amount necessary for 98% inhibition of Type 1 and Type 2 5-alpha reductase in vitro. Both types of 5-alpha-reductase are present in the human scalp with Type 1 being the predominant isoenzyme. Allowing for the usual 4 or 5 percent absorption into the dermis and epidermis upon topical application, the amount of azelaic acid at the level of the hair follicles is at least 3 times the amount required for virtually complete inhibition of DHT synthesis. You may argue that the data is from in vitro experiment (in vitro something performed or taking place in a test tube, culture dish, or elsewhere outside a living organism), and that the data cannot be transferred to human directly. As a matter of fact, that is the exact reason why Minoxidilmax also offer products containing both minoxidil with finasteride, and products containing minoxidil, azelaic acid and finasteride. 3. Does minoxidil with azelaic acid leave a residue on the scalp or hair? The azelaic acid coats the hair shafts and gives the hair the feeling of extra body comparable to a hair spray. Brushing or combing the hair after the Minoxidilmax minoxidil solution has dried will compliment the extra texture azelaic acid imparts to the hair. 4. If I use Minoxidilmax products with azelaic acid, should I continue to take finasteride to lower the DHT level in the whole body? If you have been taking oral finasteride (or Propecia) before using Minoxidilmax products, and you want keep the benefits of finasteride, you can choose products like Dualgen-15 with PG Plus or Dualgen-15 NO PG Plus and you can safely stop taking oral finasteride. These two products contain not only azelaic acid but also finasteride. The amount of finasteride in each mL (milliter) is 1 mg. When using either of these two products, you can safely stop oral fin without losing any benefit of finasteride. As MinoxidilMax products are topical finasteride, you should expect less side effects than oral finasteride. 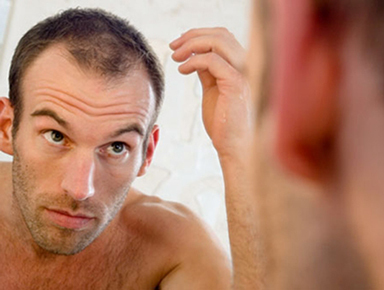 Also you will save a lot of money as you do not need to buy minoxidil solution and finasteride pills separately. 5. What is the possible side effects of Azelaic acid? Side effect associated with topical use of azelaic acid is extremely rare. 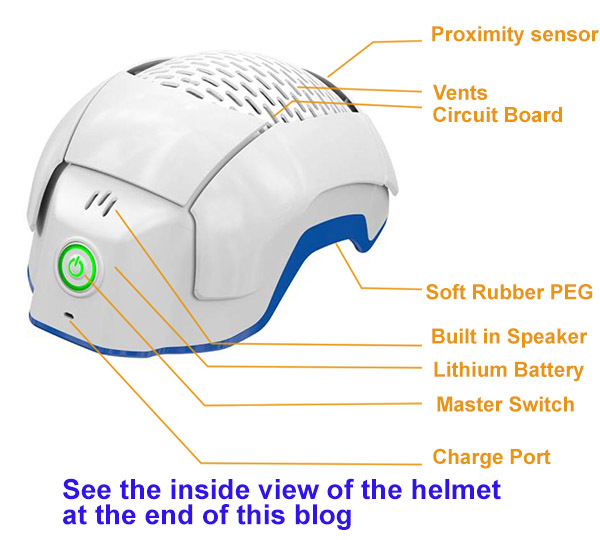 It includes: a) increased sensitivity or irritation on the scalp; 2) burning, stinging, or tingling of the skin; 3) erythema, dryness, rash, peeling happens in less than 1% of patients. The side effects usually subside after discontinuing use of azelaic acid. 6. But will it be harmful to use Minoxidilmax solutions and continue to take oral finasteride? A. Not at all. There are no contraindications to using both and doing so may be beneficial. 7. If I’ve already been using a regular 5% minoxidil, do I still have to wait at least three months to see improved results with your products? A. Generally speaking, yes. Thicker hair results from replacing existing thin hair shafts. This entails shedding of the thin hair shaft, waiting through the resting (telogen) phase of the hair cycle, and growing enough thicker hair shafts to appreciate the difference. Since the telogen phase is approximately 100 days, new thicker hairs are most often seen 4 to 6 months after initiating therapy.